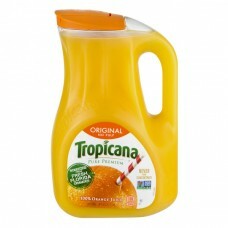 Tropicana® Pure Premium 100% Orange Juice Original No Pulp. Squeezed from fresh florida oranges. Never from concentrate. Non-GMO project. Verified. nongmoproject.org. Pasteurized. 110 Calories per 8 fl oz serving. 100% Juice. Contains 100% Orange juice. Questions or comments? Call 1-800-237-7799. www.tropicana.com. Please recycle. ©2015 Tropicana Products, Inc. Enjoy Tropicana! Keep refrigerated. Best if consumed within 7 to 10 days after opening. Shake well.